I decided to have a little go at these new Napoleonic rules. I have tried most of the new sets and these certainly look interesting. I am a new gamer with very little experience, so I am not a good judge of the accuracy of the simulation of real combat as provided by a ruleset. I do however feel comfortable assessing the clarity of the rules and the ease of applying the mechanic. It seems to me now after a couple of years of looking at different rulebooks that three basic attributes are important in a ruleset: The clarity of the description of the mechanism and the ease in applying it, the depth of the rules and finally the accuracy of the simulation of real warfare as provided the rules. I believe for me that the level of importance of each of these factors favours the order in which I have laid them out. One would think that it is probably pretty difficult to simulate warfare with little metal men on a table. I do agree though that one would hope to get what is called a historical result from a set of rules. I went with a very basic set up using the generic scenario 1 as laid out in the rulebook. 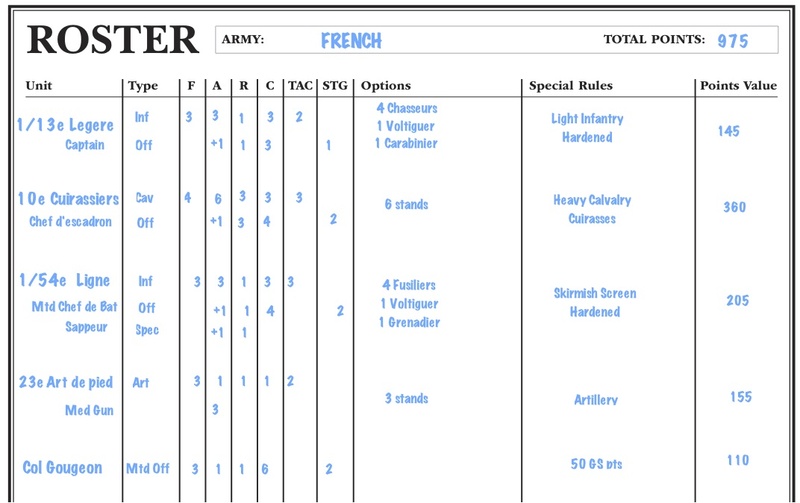 Above is the basic game set up, the British all start in line, while the French are in Attack Column. All guns are unlimbered. There are minimal terrain factors on this 6x4' terrain. It is purely a direct clash between 2 equal forces. Although I have no interest in points-based armies, I did use points to derive the OB in this case. D6 is thrown, and the British get the initiative. There are 4 phases in a turn, I liked how the first phase was the artillery bombardment, sort of felt real to me, especially on this small terrain. Each phase will be "blown out" once in the following turns in italics. The Royal Horse Artillery open up and fire at the 13e legére. Three causalities already. One TAC used, 1 left in reserve in case a move is required in the next phase. ........... I throw both a Scatter Dice-SD (again a D6 with 1-4 being the cardinal compass points and 5,6 being direct hits) and an AD, a direct hit is scored on the SD, so the results of the AD are disregarded. For illustration though, I place the small blast template. 3xD6 (1xD6 as above) are thrown with hits on 4+, 2 more hits but again one removed as the infantry are in line. So the KGL suffer 2 casualties and the South Essex 3. I use green small die to keep track of the casualties. That was a lot of fun and I have to say quite easy, I hope I got it right. Next phase is movement. British maintain the initiative. The KGL and the South Essex both advance 12" using up 3 TAC pts (this is actually wrong, as only 1 TAC can be used on movement per turn). The Guards wheel to the right and advance to assist in the advance towards the French infantry and to over them in case the cuirassiers decide to attack (bad idea!). Col Macdonald moves up to stay within command distance (12") of all his forces. The French then move and advance their infantry in Attack Column. The 13e légere use both TAC pts (see above) and advance 8", while the 54e ligne decide to be a little more cautious and advance 4" reserving 1 of their TAC's. They do not want to block the French artillery. 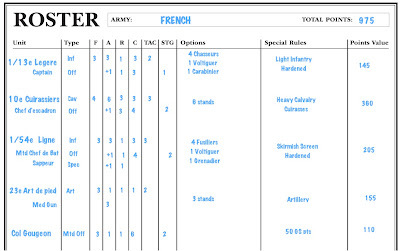 L'artillerie a pied cleverly also advance on their remaining TAC pt 4" by manhandling their guns (another error, unlimbered artillery can not move when in line, they would have to change formation to column and then move). The 10e cuirassiers expend all 3 TAC's and advance 18". Seemed straight forward enough. I use the yellow small die to keep track of each TAC pt expended. No Shooting or Melee phases in this turn. This is how it looks at the end of turn 1, quite quick and already lots of action and some blood. So far so good. The die is thrown and this time the French get the initiative. Wow, I must be used to IGO/UGO. If you look at the above photo you can see that I really left those British Guards (to the left) in jeopardy and now they are almost certainly under a charge threat from the cuirassiers. And they are in line, worse than Silly Billy! Well the French open up with their artillery. This time they are less luck with their die and only 1 more casualty is taken on the KGL. The South Essex remains intact. The British guns are quite a bit more successful with the 13e taking a total of 5 hits, those Attack Columns do not do well under cannon fire. The French movement phase follows, with the 13e légere and the 54e ligne advancing to engage the KGL. The French artillery advance (need to be in column, as above) to almost canister range, they just can not wait to open up. And of course the 10e cuirassiers charge the Coldstream Guards when they are in line. The Guards of course stand and fire, but those cuirasses make the heavy cavalry almost invincible, and with it being a difficult shot (only hit on 6+) they of course miss and the cuirassiers advance and engage the Guards, while they are in line! Well the British then advance the KGL with the South Essex slow to follow, Simmerson must of really got his knickers in a twist about those bouncing cannon balls. Or maybe he has learned! The horse artillery are manhandled 4" forward (error in respect to movement, see above) and for some reason, which escapes me, the Dragoon Guards advance to engage the 13e légere leaving the Coldstreamers to face the wrath of les cuirassiers. Well time for some musketry, on to the Shooting phase. Again the French maintain the initiative. Now I know what buckets of dice mean! Well the 13e blew all their TAC's, so they can not shoot, but the 54e can and do. They are in Attack Column, so they only get to fire with their two leading companies. They throw a D6 for each company, they get a 2+5+1 for the opening volley, so throw 8xD6 with hit on 5+ (within 9", so not difficult shots). They throw 5 hits, so the KGL(already 2 hits in place) lost a company and a stand was removed. They did not become disordered as they did not loose the company in a single turn. In return the KGL fire back, and despite losing a stand they get to throw 14xD6, and get 6 hits! The 54e remove a company and become disordered. They have to take a command check-CC. Colonel Gougeon is within 12" so we add his Command rating of 6 to 2xD6 with this score they easily pass the test by getting 17 (10 to pass). Well again that was pretty easy, and was fun. Now back to the unfortunate Coldstream Guards. They have been caught in line by the 10e cuirassiers. Time to start the Melee phase. Cavalry always go first. Since the Guards have been caught in line they have to take a CC. They lose -1 CV for being in line, but Col Macdonald is in command range so adds his 4CV, they throw 2xD6=10, so they pass the CC with a 13. The 10e have 6 attacks/base, so they start with 18xD6+6(for charging)+1(for officer)+3(supporting units)=28xD6 on wounding on 4+, they get 15 hits. Two bases are removed. The Guards attack back with their bayonets (3xD6+1flank support+1officer)=5xD6 on wounding on 5+......no hits. Result Cuirassiers 15vs0 for the Guards, they lose and since they were in line they rout. They about face and throw 10 on 2xD6 and retreat 10" with a rout marker. The 10e attempt to pursue but throw a 5 on 2xD6 and pull up short. I suppose I have made all kinds of errors, but I found these rules very easy to apply. All though the writing in the rulebook is quite clear and the content well organised, the rulebook could benefit from a detailed sample scenario. I recently played the Rapid Fire WWII rules, and this rulebook should be used as a template for all rulesets, it is absolutely superb. Notwithstanding the above, I quite enjoyed this ruleset and the basic mechanics of movement, shooting and melee were the easiest I have seen. I really do not have the knowledge base to say anything about their historical accuracy, but I am sure someone else will. I will play out the scenario, it is 10 turns, I hope to report back on the officer's special abilities and their use STG pts. John - thanks for the post - very interesting - I've posted my thoughts from it (and my own initial read of the rulebook) on my Blog. Cheers, another John. I'm glad that you are enjoying your game and will continue watching with interest. Keep up the good work/posts. Enjoyed the write up. I doubt they'd be my choice from rules (Warhammer anything wouldn't be! ), but would I play them if that's all everyone else was? - Doubtless! Look forward to reading about your further exploration of the rules. It definitely looks like a good rule. I've ordered my copy from WH. Very interesting report. What are TAG? Thanks for sharing this AAR. As a copulsive ruleset buyer, I am considereing to buy also this. Wow! It looks like buckets of dice were thrown during this game. Thanks for posting this, John. As a rules junkie I always love reading AARs from new sets. I'll have to pick these up though I'm usually not to enamoured by Warhammer mechanics (I'm with von Peter on having to do the guesswork of artillery). The figures and terrain look great! closer pics of the figures please sir! Hey, great report, my friend and I just got a set of these rules and I was out on the net tonight looking for battle reports to see how they look/play. Thanks again for the report, Im not finding too many at this time. I play War of the Ring so Im pretty excited to try Waterloo. thanks again for the battle report. Great report and lovely pics!.. I like the simplicity of these rules but they seem a little too 'fast and bloodthirsty' for me. They seem very much like Rapid Fire for Naps... and sorry to say I don't like Rapid Fire!....i.e one mad dash across the table and blast the hell out of each other. I have read and re-read these rules and I can't find anywhere where it states that you can't fire multiple times. So a stationary having 3 tacs left may fire three times upon a enemy. This combined with a 4" move per turn and 18" musketry range makes me wonder if I got things right? Can you help me on this? You are right David, there is no where in the book that I can see that stops you from shooting twice if you have the TAC points. I suggest you ask the writer directly. 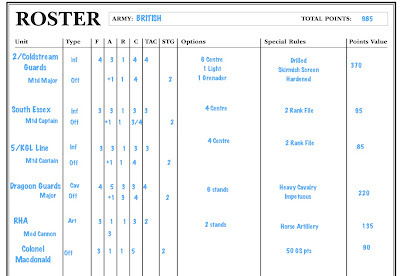 Google war hammer historical, and at the top of the web page to the right is a contact us link, use this I have got responses within a couple of days. It is a real shame that there is so little interest in these rules, as I like them. Thank you John. I guess when you tried the rules you only allowed shooting once even when units had Tac's enough to shoot multiple times? There is real gems in this book but I need too figure a few thing's out before I can give them my fair opinion. Yes that is how I did it. I have sent an email to WH to try to get an answer to your question. It is a real pity about the lack of interest for these rules, both from the general Napoleonic gaming community as well as the writer/WH itself. No forum etc. I think they might be a pretty good ruleset, but no support makes it difficult to learn how to play them. By the way, why so quiet on your blog recently. I have also sent a email, lets hope for an answer. I'm really puzzled over the short movement rates, but I suspect it has to do with the game having to be playable on a 4' deep table. 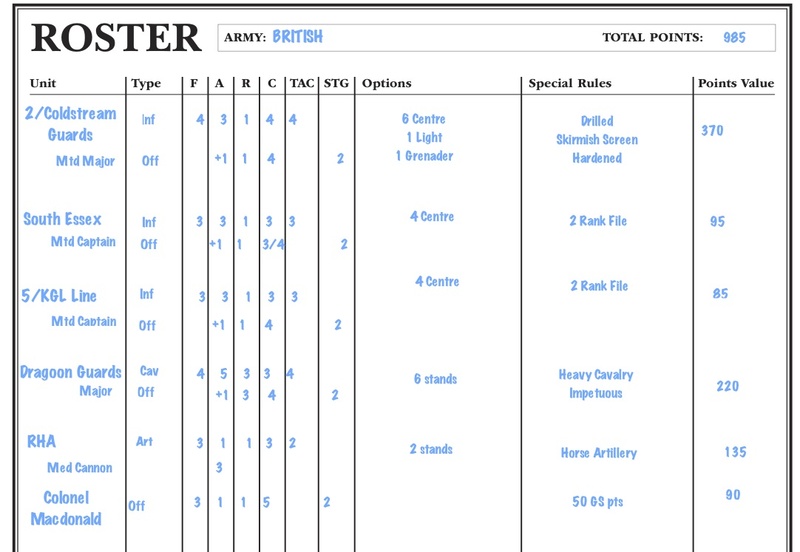 The scenarios, army lists, general shooing and moving, melee, Strategy points etc are all cool and easy rules. The artillery guess range is not a favorite of mine but I can live with it. Regarding my blog, my only opponent has other priorities and napoleonics fell down to a low priority for him which led me to loose my drive. I'm looking into playing solo on my living room floor so there might be some action soon.